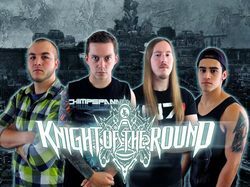 Based out of the Chicagoland area, Knight of the Round are unlike most Video Game Music bands you may have heard. Their arrangements pay homage to the memorable Final Fantasy soundtracks while bringing an assault of two crushing 8-string guitars, a grinding yet thunderous bass, and aggressive poly-rhythmic percussion with hard hitting blast beats. Spanning over a wide variety of the metal genre from classic thrash to modern progressive metal, the four piece delivers many iconic themes from Final Fantasy in the heaviest way possible.